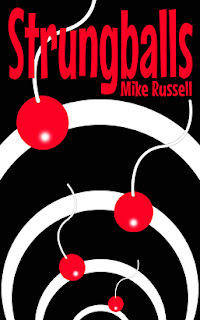 Synopsis: Strungballs is an extraordinary novella from Strange Books author Mike Russell. What are Strungballs? Ten-year-old Sydney is about to find out... but first he must have a cube of his flesh removed. Sydney will transgress everything he was taught to believe in when he embarks upon a journey that will reveal the astonishing secrets hidden by the red balls on white strings known only as... Strungballs. Inspiring, liberating, otherworldly, magical, surreal, bizarre, funny, disturbing, unique... all of these words have been used to describe the stories of Mike Russell. Remember: Once a Strungball is inserted it must never be removed. About the Author: Mike Russell is a British author best known for his books Nothing Is Strange, Strange Medicine and Strungballs. Review: An episode of "The Twilight Zone" or "The Outer Limits" in book form, 'Strungballs' is a must read for all who love the strange and unusual. Follow along as Sydney, who has lived all of his short decade of life following the rule set out for him by his parents and society. he is in the perfect position to discover the truth behind the Strungballs, and uncover secrets that many didn't even know were being hidden.